Workshop with Brock Jobe during the Program in New England Studies. 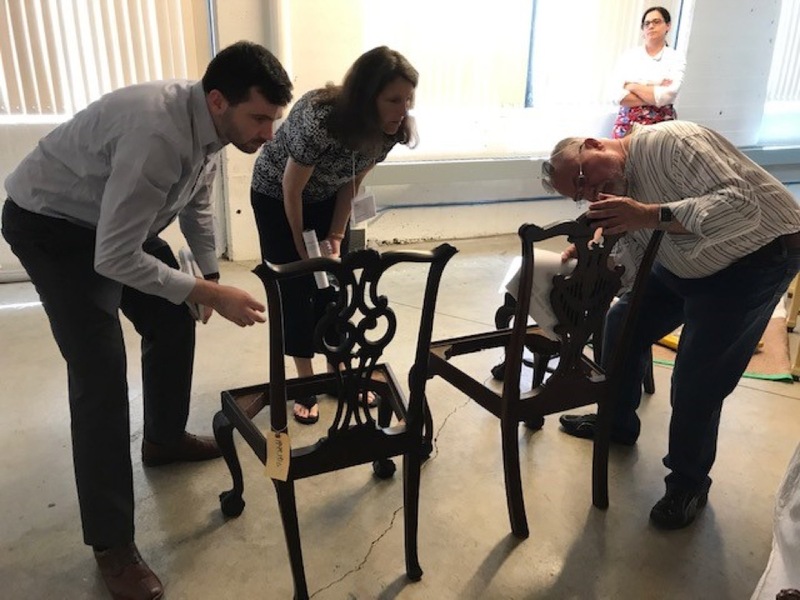 This summer Historic New England is offering its Program in New England Studies (PINES), an intensive week-long exploration of New England decorative arts and architecture from Monday, June 17 to Saturday, June 22, 2019. This biennial program explores New England history and culture from the seventeenth century to the Colonial Revival through workshops, lectures, and visits to Historic New England properties, other museums, and private homes and collections. Highlights include the restored Quincy House Museum, the recently opened museum and study center at the Eustis Estate, and a champagne reception on the terrace of Beauport, the Sleeper-McCann House on Gloucester Harbor. Registration is $1,600 and includes all lectures, admissions, transportation to special visits and excursions, daily breakfast and lunch, evening receptions, and various service charges. Participation is limited to 24 museum professionals, museum board members, collectors, and graduate students and will next be offered in 2021. Multiple scholarships are available for mid-career museum professionals and graduate students in the fields of architecture, decorative arts, material culture, or public history. At least one scholarship is available for a candidate from diverse cultural backgrounds. All are encouraged to apply. For more information, visit HistoricNewEngland.org or contact Ken Turino, Manager of Community Engagement and Exhibitions, at 617-994-5958. This entry was posted in Collections, Design, History, Training and tagged Historic New England, Massachusetts on February 12, 2019 by Max van Balgooy. Why is the average age of guest instructors is about 75? Wonder if they know there is a rising generation of talent that deserves their turn in the spotlight? The whole heritage biz needs to get real about sustaining the movement that took off in 1970s but now faces headwinds that must be addressed by those coming up.